The short answer is: any generic type you happen to find in your junk box will do: For D1 and D2 I used a 1N4148 (I have a ton of those), for Q1 I used a BC 559 (as long as it’s a PNP transistor you’ll be fine), and for R1 I used 10k in series with a 100k variable resistor, so I could adjust the current in order to experiment. In the end I just set it to minimum resistance. I used a 1nF ceramic capacitor for C1, but haven’t experimented with the value. It’s not critical either. Then I tried some diodes, and settled for a 10V zener diode that was quite noisy. The entire thing is fed by 2 9V batteries in series to get 18V. I am preparing a new article that goes a bit more in-depth, it should be ready one of these days. Have fun, if you have any more questions feel free to ask. (Or if you have some results, that would be great too). Oh I see, you meant subtracting the logarithms. he well, ca very well on with key cinercy and noise generator from 0 to 2 ghz. filter is installed between the elements 2. Is less than a well with professional analyzer ca optiontracking but allows to easily a first approach to filter settings with a low cost equipment. (Edited to undo the all caps – ON8VQ). ola teria como sintonizar filtros de cavidades passa baixo, passa faixa, com essa sua grande descoberta, e como fazer? Google translate told me that you asked: hello would like tuning cavity filters low-pass, band, with this his great discovery, and how to do? Tuning filters is also on my list. Even without using the compare tool, you should be able to see the filter shape clearly. So you just connect the noise source, an attenuator for rough impedance matching, and your filter to the dongle. First do a wide sweep to locate the passband or cutoff frequency. Then you select the “continuous” setting in the rtlsdr-scanner utility. By moving fast (16ms setting), and only scanning the frequency range of interest, you may get a new sweep every 5-10 seconds. Then you tune your filter. When you are done, you can use the compare tool, as described in the article, to get a better view of the actual shape, the insertion loss etc. It will be slower than with a real-time spectrum analyzer, but I think it will still be acceptable. This is great! I have it working now, just need the time to go to the repeater site and tune the multicouplers. I can also use a radio that I trust the TX freq with a step attenuator for rought tuning of the filters and to calibrate the dongle. Thanks for all your hard work. really nice post and clever idea. I have a short question. I’m also planning to use my SDR dongle as a spectrum analyser. To what extent is it safe to connect signals (from your noise generator, RF oscillator, …) directly to the dongle antenna input? What is the maximum input voltage and current limits you used? Frankly, I have no idea. I doubt that a volt could do it any harm. I also think that at that voltage, the ADC will have reached clipping. But in the end, it’s a guessing game. Use attenuators to add protection. 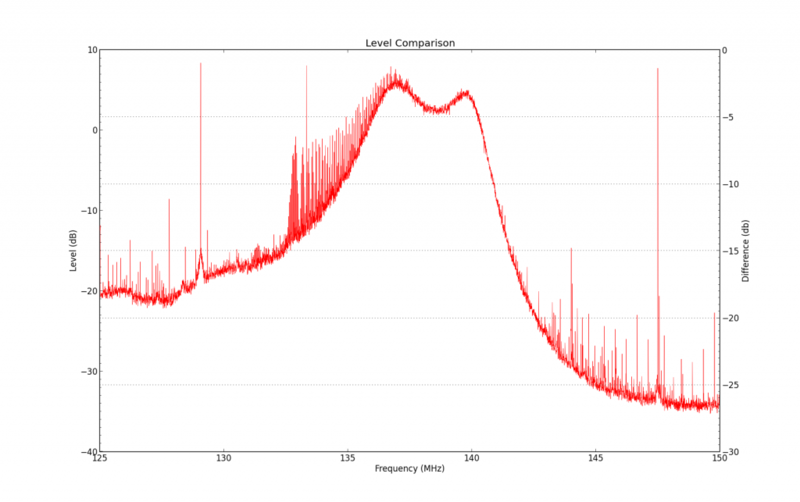 Maximum input for RTL-SDR dongle is 10 dBm RF signal. 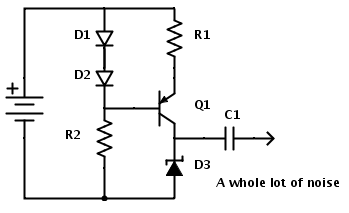 Input impedance is 75 ohms not 50 so any attenuator circuit used preferably should have 50 ohm input and 75 ohm output but this isn’t a critical issue if you use a short (< 1 m) connecting cable to the RTL-SDR 's input. I use RG59/RG6 cables which are 75-ohms. All in all, a very nice RF noise generator circuit and application for the RTL-SDR dongles besides using them as receivers! Test gear is very pricey (like how many of us have a $5000 spectrum analyzer sitting on our test benches! used diode 9.1v zener it works! thank you! Did you check the full spectrum response of the generator? How far it goes? It is a while ago, but it did go to 500 MHz at least, and I think even close to 1 GHz? I can’t remember for sure, sorry. It does depend on the diode you use, so be sure to experiment a bit. If you really want to go high up in frequency, I would suggest looking into diodes that are specifically designed to be used as noise source. Or just buy a noise source on ebay – there are rather cheap Chinese modules to be found, for example: http://www.benl.ebay.be/itm/DC-12V-0-3A-SMA-noise-source-Simple-spectrum-external-tracking-source-DY2-/172150915301 .